Our guide meet you at your place. Take a taxi to train station for catching train to Yen Bai LC3(06.10/1040). Upon arrival, you will transfer to Lavie Vulinh. Check in and enjoy lunch. Breakfast at the hotel. 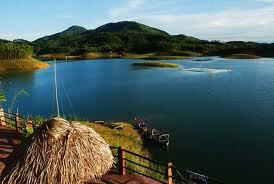 After that you will have a chance to visit Ngoi Tu village and Thac Ba Lake. Start a cruise on traditional boats, stop by an island and discover the particularities of this area: the way villagers paddle their boats, the exotic and odd animals living around, the quiet and peaceful beauty of this huge lake, the lifestyle of the Dao among the thousands of islets… Unforgettable experience and amazing panoramic view of the lake! Return to LaVie VuLih by boat about 2pm. Lunch is served. Free for your own leisure in the rest day. This day is free for you to do what you desire. Then transfer to Yen Bai train station to come back Hanoi LC4 (14.50/20.00). End of services./. What to bring: Passport, Sun glasses and hat, toiletries, sunblock, insect repellent, flashlights, personal firs aid kid and medicines, small VND notes for buyng drinks.